Kedaton temple can be found in the village of Sentonorejo, Trowulan. The site displays extensive brick foundations, supporting a suggestion that it may once have been the location of a palace. A legend connects the poison well / Sumur Upas, which lies within the Kedaton complex, with the Majapahit royal family. According to the story, it was at Sumur Upas that Brawijaya V*, last king of Majapahit, 'vanished from sight', rather than face defeat. Popular belief has it that Brawijaya retired to a supernatural kingdom, said to be situated on the peak of Mt Lawu. 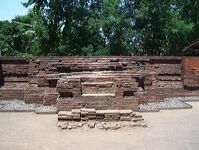 Brick making is an industry which has continued at Trowulan since the time of Majapahit.